Dust, a computer’s worst enemy and what to do about it ! So I have dust in my computer, why is this important and what should I do about it. One important aspect of owning a computer that is often overlooked is internal dust buildup. 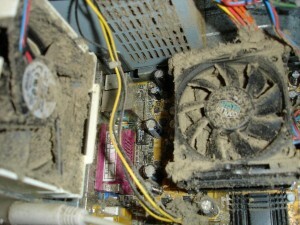 Dust is attracted to the inside of your computer like a magnet and will get into the computer and buildup on and around all the sensitive electronics that make your computer run properly. 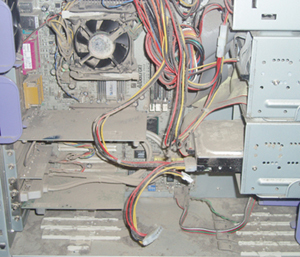 Dust inside a computer insulates the sensitive electronic components and causes a heat buildup of abnormal levels and gradually degrades the circuits and chips underneath all that dust and thereby causes intermittent and usually unexplainable problems and even complete failure. (see pictures below) Most commonly the fans inside a computer become clogged with dust and cannot operate at peak efficiency or in some cases at all. When the fan doesn’t work, the electronic components it is protecting overheats and in time this will cause it to fail and ultimately cause your computer to crash ! 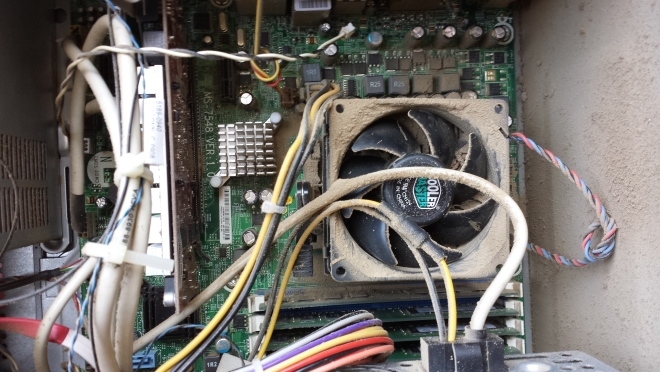 I recommended that the inside of a desktop computer be cleaned at least two times a year and up to four or more times if you live in an area that is prone to a lot of dirt,dust,cigarette or cigar smoke and or pet hair. The procedure is simple and quick. A can of compressed air can be picked up at your local office supply, hardware, or camera store and will do nicely, just don’t spray the air with the can upside down otherwise you may get exposed to harmfully cold chemicals that may cause injury to you and the computer. After carefully making a note of the locations, disconnect all of the cables from the back of the PC. Most desktop computers have only one or two screws that hold on the side or top panel. Take the desktop outside or into a garage to clean it. This will help keep the excess dust from accumulating near the desktop area and being drawn back into the computer, later. A dust mask should be worn for those that are prone to dust allergies. The areas to target, inside the desktop case, are the heat sink over the CPU (Central Processing Unit), the heat sink over the GPU (Graphic Processing Unit) and any other heat sinks found inside. Also, all fans should be cleaned thoroughly. Each fan should be blasted with the can of air until it spins up to speed. This helps remove dust and tests fans, as well. If a fan will not spin fast while it is being subjected to the force from a can of air, it should be replaced. 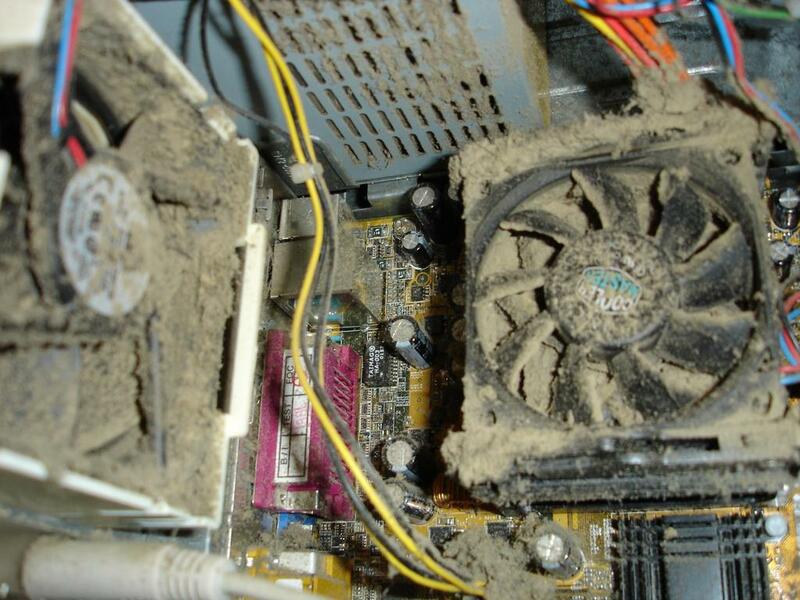 The power supply should be cleaned, also. The power supply is usually located in the back and upper portion of the case (for a tower), the fans of some power supplies are inside and cannot be seen clearly. Again, use the can of air and blow through the vents of the power supply. The fan will spin and the dust will be forced out. Conclusion: Regular dust removal will significantly prolong the life and performance of your computer and provide you with a better overall computing experience and best of all fewer visits to the computer doctor….. This entry was posted in Desktops by Steve. Bookmark the permalink.